When we come out of School, one of the first questions that I ask Big Boy is What did you do today? Normally Big Boy answers "Just Playing!" and hopes I will leave it at that. Some parents might, but I know that "Just Playing" is actually code for learning when you're five and so I ask some more leading questions about what sort of things he played. 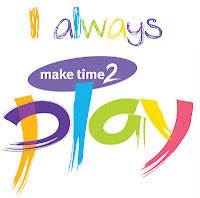 It is because I know the importance of play that I was pleased to be a part of the Make Time 2 Play Campaign with the British Toy and Hobby Association’s Make Time 2 Play Campaign. I was lucky as a child, my Mum knew that playing wasn't a reward or a waste of time, but it was a way that my Sister and I learnt best. I've tried to carry it on the way she taught and the way that experts have discovered to be the best way to help Children learn too. Research shows that if you incorporate themes into children's learning it makes the experience more memorable for them and less scary and then they will be more willing to do it again and again. And with the children being more willing to learn in a setting like this it helps them to develop skills such as problem solving and develop their attention span, social development and their creativity. Of course we also do it at home too, but the next time you hear a child saying that all they did at School was play remember that what they actually mean is they were learning... they just didn't realise it!